Applications are invited from Indian citizens (Male & Female) for filling up the post of 359 vacancies [Head Constable/GD-19(Male) & 01(Female) and Constables/GD-295(Male) & 44(Female)] under Sports Quota for the year-2018 in Central Reserve Police Force, Government of India, Ministry of Home Affairs. The post is temporary, but likely to be continued. Selected candidates are liable to serve anywhere in India or outside the territory of India and will be governed by CRPF Act and Rules. 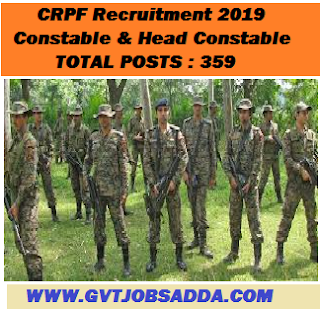 Those interested & eligible candidates May check official notification regarding CRPF Recruitment 2019 Constable Head Constable Posts & read crpf notification carefully and apply before last date 13-01-2019.Brief information About CRPF Recruitment 2019 Constable & Head Constable Posts Has Given Below. Application Fees : RUPEES ONE HUNDRED ONLY (Rs. 100.00) in the form of Crossed Indian Postal Order/Demand Draft/Banker’s Cheque along with their application in favour of “DIGP, GC CRPF, Jharoda Kalan, New Delhi, Fee is exempted for all Female candidates and candidates belonging to Scheduled Caste and Scheduled Tribe eligible for reservation. Upper Age Relaxation is applicable as per rule. HC/GD (against sports quota) :10+2 or equivalent from a recognized Board/ University. 2.CT/GD (against sports quota) : Matriculation or equivalent from a recognized Board/ University. HOW TO APPLY:- Eligible and desirous candidates should send their application in the prescribed proforma duly typed as given in Annexure-‘A’ duly filled in on foolscap paper with two attested passport size photographs, one duly affixed on application form and one on the admit card at the space prescribed for the purpose and duly completed in all respect addressed to “The DIG, Group Centre, CRPF, Jharoda Kalan, New Delhi-110072” on or before 13/01/2019 repeat 13/01/2019 super scribing on the envelope “APPLICATION FOR THE RECRUITMENT OF SPORTSPERSON IN CRPF AGAINST SPORTS QUOTA-2018” along with the required documents. However, candidates belonging to far flung areas of States of NE Region, Ladakh Division of J&K, Sikkim, Pangi Sub-Division of Chamba District, Lahaul & Spiti district of Himachal Pradesh, A&N Island, Lakshdweep can submit their application by 28/01/2019 repeat 28/01/2019 at 5.00 PM. The application received after the last/due date will not be entertained and summarily rejected. Incomplete application, in any respect will be rejected summarily and no correspondence will be entertained on this account.